At first glance, Jolica may seem like another work from home business where “gift consultants” host in-home parties selling products. Every sale not only earns the hostess free and half price products, it also generates a contribution to the Jolica Foundation. The hostess chooses which of Jolica’s current projects she wants to support with her party. Current choices include providing the gift of sight in India, which provides cataract surgeries for adults to restore sight and Vitamin A supplements for children to prevent blindness, or the gift of hope in Morocco, which provides entrepreneurial training for unemployed youth. But the parties aren’t just about a small donation. 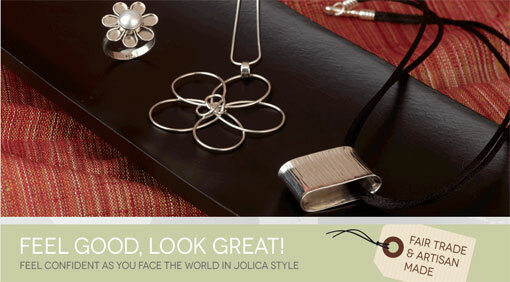 All of Jolica’s products are fair trade and artisan made. The company is known for its beautifully hand made creations from sterling silver jewelry, handwoven silk scarves to leather handbags. The products are made by local artisans from far away places such as India, Chile, Peru and Thailand. By purchasing fair trade products, Jolica helps to support small scale businesses in communities in the developing world. Beyond that, every sale contributes to the Jolica Foundation. By the way, the jewelry is gorgeous. The tagline of “the art of giving” seems pretty appropriate. If I were to do these type of in-home parties, I would definitely consider Jolica. Where else can you host a party, make some extra cash and give back at the same time? Wow, I love this! Thanks for highlighting Jolica. Although I’m certainly not looking to get involved in another venture (how many balls do I have up in the air already?! ), it’s made me think about the future of my nature programs. I’m looking to incorporate as a non-profit (if I can find funding assistant to do so…), and hope it will eventually generate enough cash flow so that it can also help support conservation causes that I’m passionate about. So glad to hear it has inspired you. That’s exactly why I’m writing these posts. There’s more to business than just making money. Making a difference in the world can be a very viable aspect of your business model. I’m still looking at ways to incorporate more giving into my own. Good luck! I would like to thank you for featuring Jolica as well. I have been involved with this Company since March of 2008 as the first Saskatchewan consultant at the time. Since then – our growth has been small, yet consistent, which still makes this (as the industry says) a ground floor opportunity with tremendous potential for growth. I find that the type of people that decide to join our Jolica team are more focused on the ‘giving back’ aspect as opposed to the ‘making money aspect’. With that – the result of this, for anyone who wants to make this a viable income has wide open territory no matter where you are, as every area in the U.S. or Canada has yet to become even the least bit saturated!! Maybe with the exposure of this blog, Jolica will become less of a ‘well kept secret’!!! For anyone who is interested in an amazing and well rounded product line, a party plan enterprise, or starting your own business, and of course, making the world a better place, I invite you to explore Jolica as an option. It may be just what you are looking for!! I know that I have certainly never looked back and am happy to answer any of your questions about what jolica can do for you. Thanks, Lorna. It’s great to hear from a Jolica consultant. I was very impressed with the company when I found out about it. Happy to help spread the word!